Things are not rosy over in the land of lane-pushing and tower-diving. 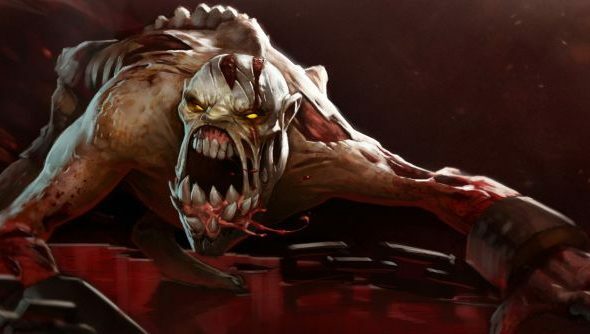 A sharp decline in average player numbers has hit Dota 2 in the wake of the introduction of Reborn as the main client for the game. Via tracking site Steam Charts, there was a 16% drop in average players in September alone, the largest in the game’s history by some 40,000. It also marks the lowest number of average players in a month since October 2014. There are a number of possible explanations. The time of year is one unfriendly to games – time-rich students, teenagers and kids are returning to school, as is anyone else who works in the education sector. However, other years did not see a similar drop and other games haven’t observed such a significant impact this year either. While it’s true that those sectors make up a large portion of Dota’s playerbase, a drop of this size would require half the angry teens of the western world to get banned from Steam in one go, and I haven’t executed that phase of my plan yet. Reborn itself is also shouldering some blame. The Dota subreddit is still packed with complaints every day about bugs, exploits and real-game situations where they’re occuring. Most recently Valve had to issue an update to fix broken hitboxes that were making enemy heroes, creeps and neutrals difficult to click on in a pinch. There’s serious problems with specific visual effects being visible in fog of war, revealing the location of enemies. With enjoyment of a MOBA already balanced on a knife edge, it’s easy to imagine players quitting in frustration when these problems occur. It’s also worth noting that 2015 as a whole has seen a flattening of Dota 2’s popularity curve. While the game has steadily grown month on month since 2012 up until now, it seemed to peak at around 600k average players in February/March of this year. Since then it’s sat steady in the mid 500,000s, other than another spike in August, likely off the back of TI5 hype. Doomsayers can go home, the game is hardly dying, but may have hit a glass ceiling for the time being. Then there’s the game itself. The last patch cycle was definitely too long, with everyone ready to move on by the end of TI5. That’s fairly normal, but, at least to me, the want from the community for changes seemed far greater this time around – not least because of the mine-laying Techies. However, rather than the usual big TI patch that introduces a new hero and changes some of the very building blocks of the game itself, a balance patch was issued, with larger changes promised for after the Frankfurt Major. These patches are usually so significant that they draw interested eyes from all over gaming to see how one of the oldest and best competitive games in the world is reinventing itself this year – that hasn’t happened, yet. So what does it mean? Nothing, yet. If the game sees another big drop, more investigation will be needed to see where these players are going. Plus, Valve’s next big impact on the game, probably the post-Frankfurt patch, will be a key moment to see if Dota can still draw public attention. Frankfurt itself will play a role also: an exciting tournament always inspires more players into a game. We’ll keep on eye on it but in the mean time, have any of you recently jumped out (or in) to Dota 2?